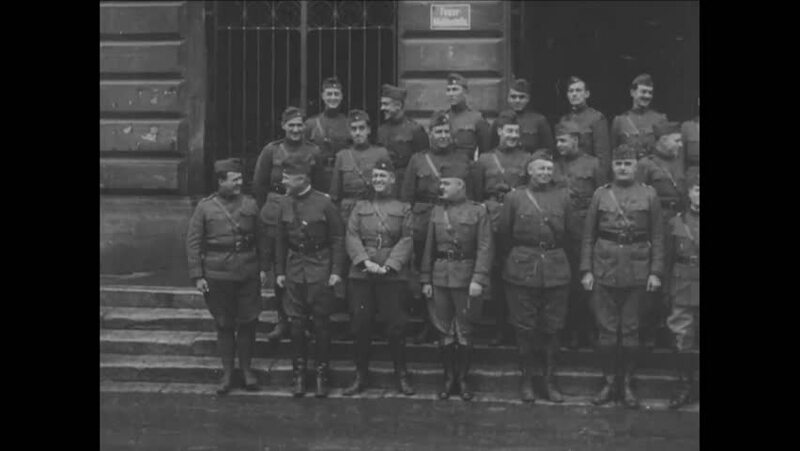 CIRCA 1919 - Generals Ely, Castner, and Malone pose along with other officers. hd01:18CIRCA 1918 - Soldiers on a waterfront in France supervise as cargo is unloaded from ships. hd00:49CIRCA 1918\xD1Members of the Russian military greet members of the AEF in Northern Russia. hd00:36CIRCA 1920s - Shots of the De Blauwe Winkel store, and a boy stands in front of a De Blauwe Winkel store with a toy in Bolstraat, Amsterdam. hd01:45CIRCA 1960s - Student soldiers attend a lecture on guerrilla tactics and a soldier studies in his room, at Fort Bragg, in North Carolina, in 1963.
hd00:58CIRCA 1950s - Soldiers march in formation as they leave their camp and install a tent camp in the 1950s. hd00:57CIRCA 1918 - Soldiers pose and leave the barracks on the grounds of a military camp in France.